The palatial department store opened its first Wisconsin location on Saturday. We got the inside scoop. Though it’s too new to appear in your phone’s GPS, it’s hard to miss the Milwaukee area’s Von Maur store as you head west on I-94. The store is nothing short of palatial, from its rooftop cupolas to the large, arched windows that bring natural light into its central thoroughfare. Over one thousand grand opening attendees lined up outside the 150,000-square-foot store at the Corners of Brookfield Saturday, April 8 for the ribbon cutting ceremony. Jim von Maur, president of Von Maur, was joined by city officials and developers, as well as his younger family members, to cut a green ribbon and officially open the company’s first Wisconsin store. von Maur noted that the company has wanted a Milwaukee location for 20 years. Service is at the center of the Von Maur mission. 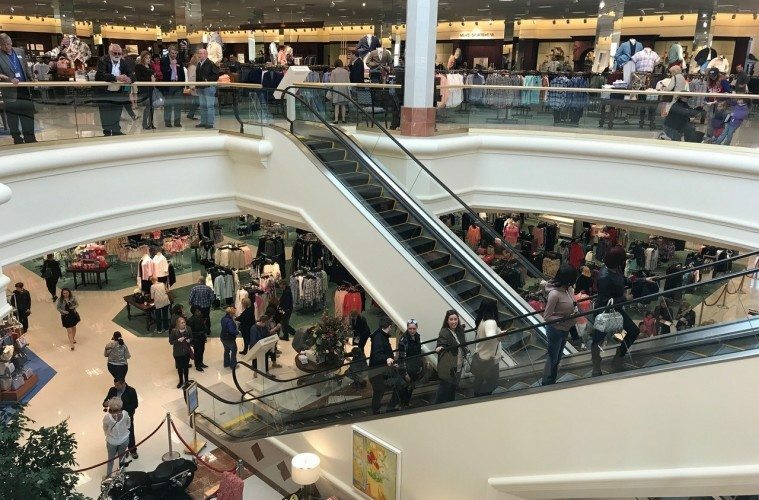 As customers flooded the store’s main entrance at 10:00 a.m. each woman attendee was handed a rose and a chocolate bar bearing the Von Maur logo. Sales associates and members of the von Maur family greeted customers with smiles and enthusiasm, which made for a high energy environment. The presence of the von Maur family maintained the store’s signature residential ambiance. While there are racks and a few department signs, the store feels and even smells far more residential than commercial thanks to some combination of newness and roses. The lighting is warm and inviting, and details like musical instruments, plants, and unique display tables add to the homelike feel. Members of the press were asked not to disturb customers by interviewing them as they attended the grand opening. It was clear that every member of the team had customer service on his or her mind, which made for a smooth event—and store. With plans to employ over 200 associates, you can expect the store to remain as neat and organized as it was on day one. These small details—in addition to the store’s unique selection of merchandise—are what set Von Maur apart from the competition, according to Jim von Maur. And he’s not concerned about opening a brick-and-mortar store in 2017—when the internet is a tough competitor. In fact, he attributes much of Von Maur’s success and individuality to this. “We are proud of the fact Von Maur hasn’t changed and we have run a store like it’s always been run.” The first Von Maur store opened in Davenport, Iowa 140 years ago by C.J. von Maur. Jim von Maur mentioned Von Maur’s uncluttered aisles, great selection, lack of “dump tables” and career employees who are paid above-market wages as contributions to the company’s success. The store’s manager, Katie Young, has been with Von Maur for over eight years, starting as a full-time sales associate in women’s shoes and working her way up to management. She previously managed Von Maur stores in Atlanta and recently moved to Milwaukee with her family to manage the Brookfield Von Maur. Young’s focus, like the von Maur family’s, is the customer experience. “[Customers] don’t yet know the benefits we have to offer, and the exciting part for me is to get to share that with [them],” Young said. A visitor to the Brookfield store certainly feels the customer focus as a recurring theme. And Jim von Maur wants potential customers to know they are welcome. “We have good, better and best, and we don’t want people to be intimated by how beautiful our store is,” he said, adding that there’s something for everyone—no matter their age, taste, or budget—at Von Maur. Von Maur is now open at 20111 Lord St. in Brookfield, from 10 a.m. to 9 p.m. Monday through Saturday, and 11 a.m. to 6 p.m. on Sundays.